The new fine dust sensor is based on laser technology and measures the particle pollution of the air in two categories: PM2.5 and PM 10, that is, particulate matter with a diameter of 0.3 to 2.5 micrometers or 0.3 to 10 micrometers respectively. The new fine dust sensor is targeted for use in office and high-end residential buildings, the statement said. During operation, dust particles accumulate on fine dust sensors, reducing their performance over time. 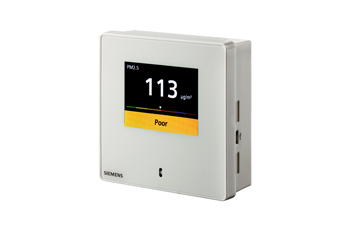 The Siemens sensor has a display that is activated only when the presence of people is detected. When no presence is detected in the room, the frequency of particulate matter measurements decreases, significantly improving the service life of the fine dust sensor, it said. When the sensor module needs to be replaced, the device alerts users either on the display itself or, on models without a display, through an LED light. It is not necessary to buy a new device or reconfigure it. Replacing the sensor module is quick and easy and does not require any special skills, it added. The fine dust sensor has been calibrated to measure PM 2.5 particles and can be set to different air quality index (AIQ) levels to meet specific national regulations. Laser light scattering is used to measure the particulate concentration. The user interface of the device can be displayed in German, English, French and Chinese. According to the company, carbon dioxide (CO2) sensors help reduce the CO2 concentration of the ambient air and, conversely, increase the oxygen (O2) concentration in order to improve employee productivity. Effective temperature and humidity control decreases the risk of illnesses such as respiratory tract infections and influenza. Volatile organic compound (VOC) sensors are used to measure the harmful outgassing originating from building materials and items such as carpets and furniture. All sensors have analog signal and Modbus outputs, allowing them to be connected to Siemens heating, ventilation and air conditioning controls such as Climatix and Desigo Room Automation as well as integrated into building management systems such as Desigo CC.